If we were having this conversation in 1960 it might have gone a bit differently. All we had about Pontius Pilate in 1960 was a few lines in the four gospels, and a reference in Philo, and another in Josephus. So Pilate was a bit of a shadowy figure, and we were a little unsure of what material was dependent on what, and of his role in the literature that we did have. How much history was behind this shadowy figure? How much was he constructed to fulfil a certain role in the story? What happened after 1960? Nearly 2,000 years after Pilate, in Caesarea, on the coast of Palestine/Israel, archaeologists excavating an ancient theatre discovered a stone with an inscription (image). The stone had been reused in the 4th century as part of some stairs. 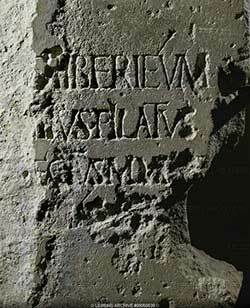 It is the only inscription we have which mentions Pilate. Caesarea, on the coast, was his capital, the capital of the Province of Judaea. This is the historian’s proof positive about Pilate. So what sort of person was Pilate? The early historian, Josephus, mentions that Pilate’s predecessors had respected Jewish beliefs in Jerusalem, and removed Roman images as the soldiers entered Jerusalem. Pilate, however, allowed them to be brought in at night, but when the citizens discovered this in the morning they appealed to Pilate to remove them. There was a stand off for five days, and then Pilate ordered the protesters to be surrounded by his army. Pilate threatened them with death. OK – they said – we’ll die for this. Well, Pilate gave in. This fits with the picture we get of Pilate from elsewhere. Violent and unpredictable. Pilate’s term as prefect ended when he ordered an attack on Samaritans gathering at Mount Gerizim – it looks a bit like another Jesus-type movement beginning. Many Samaritans were killed, and Pilate was called to Rome to explain his actions. He didn’t return. Christianity is grounded in history. Other religions and spiritualities do not see being connected to history as being important. For many Hindus it wouldn’t matter a scrap whether a particular myth had any connection to history or not. In fact some spirituality traditions are about escaping from this day-to-day history of this world. I am not saying that every point in every story about Jesus is necessarily historical as presented – not at all. But the historicity is important. Jesus was born of Mary; he did suffer crucifixion under Pontius Pilate. History, this world, the concrete facts of our life are important. 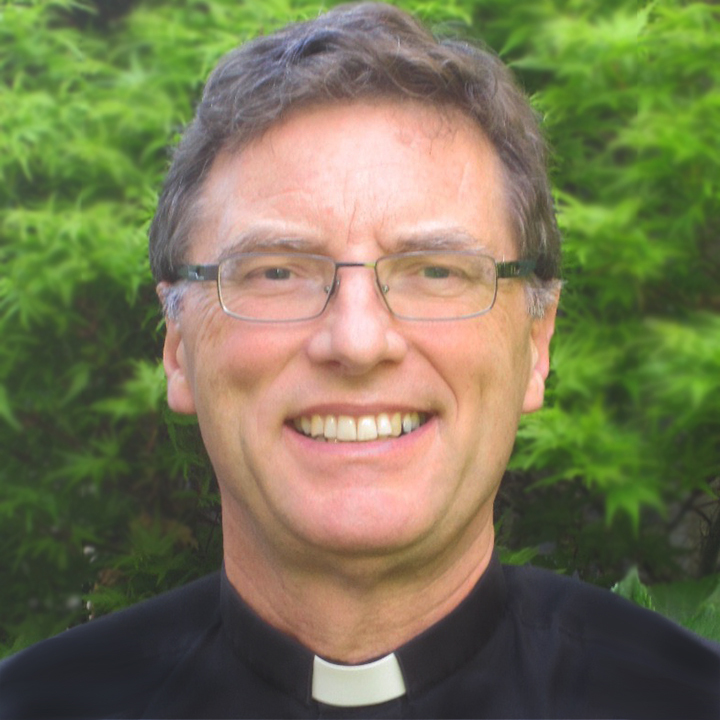 Christian spirituality is not about escaping from this world to a spiritual better place. It is about finding God and love and truth and beauty and meaning in this actual world. The temptation is to imagine that if I were someone else, if you lived in a different place, or had a different family, or had so-and-so’s skills, or personality or abilities – then life would be great. I in my concrete actual life, you in your actual concrete life – with your gifts, and skills, and context, and limitations – the time we live in, the place we live in – this is where, Christianity says, we need to find God and love and truth and beauty and meaning. This is the thirteenth post in a series on the Creed. The first is Apostles’ Creed. The second is I believe in God. The third is a source of the Apostles’ Creed. The fourth is I believe in the Father. The fifth is Handing over the Creed. Martin Hengel in his book Crucifixion (1977) reminds us the crucifixion was widespread in antiquity, and that the punishment was harsh and sadistic. In this truth, I find it hard to see beauty. With the spectre of the fires of Gehenna the stench would make one sick. Entering churches that display crucifixes with Jesus hardly wounded and in a loincloth, might add to the to the ascetics of ‘credal belief’ but hardly places ‘faith’ upon history. Crucified under Pontius Pilate, but there is a need to recognise the torture, the flogging, and the utmost humiliation of the human sacrifice and the deprivation of human dignity.